More like Terminator Crow to me. I love the concept of a robotic Raven. Damn nice work! Just hope it doesn't makes me creeped out in the mod, always they find a way to creep people out with ravens in movies or games. Most people don't really consider/realize how deeply embedded symbolism is and always has been in their daily lives. Whether it be art, literature or entertainment media. In this case, I think this a superb variation on a classic example. Raven? Awww... could have been a Crowbot. 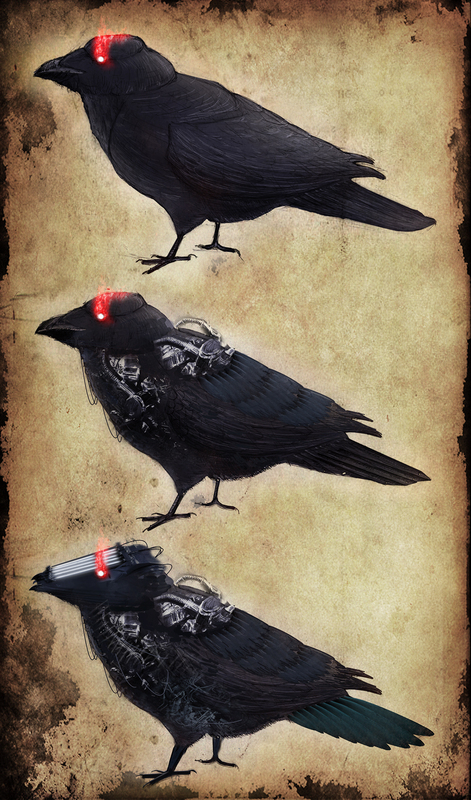 This shows the metamorphosis of an important symbol in the game: A red-eyed raven. The first raven can be found in the Outer Ring, the second one in the Inner Ring and the last one can only be seen in the Core.